You are currently browsing the category archive for the ‘PR’ category. It’s become a truism that new technology can spark dramatic changes in business and society. In recent years, a confluence of new social, digital and mobile tools has totally changed how people access, create, track and share information. Communication disciplines like PR and journalism have been irreversibly transformed, though many are still struggling to adapt to the new reality. Well, the laggards better hurry because the next wave of change may be here, and it is virtual reality. I recently had the opportunity to join a webinar by The Gronstedt Group that positioned virtual and augmented reality as a potential game changer for many industries, including public relations. The Gronstedt Group has been working with clients on the cutting-edge of technology for years, notably using 2D virtual environments like Second Life as interactive platforms for employee training and collaboration. But the emergence of new and affordable 3D virtual or augmented reality devices has changed the game – again. There are obvious reasons why virtual and augmented reality has huge potential as a communication platform. The 3D environment is an immersive, powerful multi-sensory experience that goes well beyond 2D content like video or computer games. It’s the ultimate 360 experiential media. As such, it can carry more emotional and dramatic weight than video. The other key development that will drive adoption and usage is the increased affordability and variety of VR tools, with the best example being the Google cardboard viewer ($15) which can be used with a smart phone and a special app. That’s a far cry from Facebook’s Oculus Rift (which requires a headset and special PC bundle) or the even more advanced HTC Vine – which allows for positional tracking. So the barriers to entry for both users and producers are getting lower every day. On the augmented reality front (which combines digital content on virtual screens with the real environment) the introduction of Microsoft’s HoloLens opens the door to broader corporate and consumer use. Early examples of VR content demonstrate the huge potential for this technology. Though initial efforts focused on interactive gaming and specialized training (like medical training, flight simulation and even an NFL module to train quarterbacks) we’ve seen a range of exciting VR applications in journalism, marketing and entertainment. Notable examples include a ground-breaking virtual video story by the New York Times in April 2015 (distributed via free Google VR headsets) and a gruesome VR film shared at the World Economic Forum in Davos in January to dramatize the Syrian refugee crisis. (The director of “Clouds over Sidra” called his VR film the ultimate empathy machine.) In fact, the New York Times now provides a wide range of content in VR through its website, making a big play for what is calls “virtual reality journalism.”. Google’s Expeditions VR program has allowed half a million students to go on virtual field trips to global landmarks like Machu Picchu and the Great Barrier Reef. It’s now possible for home buyers to visit virtual open houses through VR content. Just this week the New Yorker magazine produced its online issue with augmented reality digital cover featuring the NYC skyline. Virtual reality essentially opens the door to a new art or communication form. This is important not just for the sake of creative license or technological progress, but because the virtual outcomes will be more compelling and immediate, and the communication process itself more effective and impactful. This is a new frontier for communication disciplines like PR. Let’s hope communication professionals are paying attention and proactively take advantage of the VR technology. This disregard for truth is being played out prominently in the political realm. One end of year report by PolitiFact tallied up a list of the least truthful politicians, which detailed a percentage of exaggeration and lies shocking even in a political campaign context. (Ben Carson wins the dubious crown.) But Carson, Trump and others seem to care little about these third-party assessments of their credibility. In fact, rather than being embarrassed or admonished they almost seem to relish the controversy, and use the occasion to vigorously attack the credibility of the ‘mainstream media’ and claim the findings are politically biased. Any contradiction or question is angrily (or sarcastically) dismissed as an adversarial personal attack. Carly Fiorina has developed a refined model of this response: she stubbornly, defiantly repeats her dubious claims (such as the discredited abortion video story) in spite of overwhelming evidence her story has no merit. In this context opinions, policy positions and arguments are often trumpeted as facts – as if repetition and conviction obviates the need for actual empirical evidence. This trend spans across the political spectrum, and damages the quality and relevance of public discourse for all politicians. There are no winners here in the long-term. For while provocative statements may excite a small group of voters in the short-term, all politicians will ultimately suffer in an environment where arguments (and accusations) can be made without corroboration, objective vetting or third-party analysis. Perhaps most troubling is that the most ardent followers of these politicians-in-waiting seem immune and uninterested in any fact-finding or evidence that contradicts their favorite pols. Even if they acknowledge a story might be a stretch, they admire the fact their candidate isn’t afraid to rock the boat and share his/her real views. In essence, facts don’t seem to matter much anymore, at least in public discourse. There is information on the Internet available to back any claim, no matter how outrageous, and standards or probity have become largely subjective. Fact-finding sites and third-party sources are often dismissed as biased or elitist. The result is a population that is dangerously misinformed, or at least willingly misguided, on a range of issues. They believe what they want to believe, and nothing will change their mind. Trying to subvert or ignore truth is nothing new, of course. In recent years we’ve seen this on a grand scale, notably the attempts by the tobacco and gas industries to bury evidence and create their own narrative to suit their business interests. But what may be new is the prevalence and prominence of hoaxes and half-truths in the public realm, and the realization that many citizens don’t seem that alarmed. The result can be disastrous for the public good, as in the case of the tobacco lobby activities. It remains to be seen whether the majority of citizens will push back and demand that their leaders be transparent and truthful, or at least responsive to legitimate questions. Either way, the erosion of truth and objective analysis raises critical questions for the PR industry. It’s an easy temptation to join the parade and counsel clients on crafting and promoting their own narrative without consideration for evidence or credibility. But this is an opportunity for serious professionals to focus on their core values and principles (which likely feature honesty and ethics) and provide a grown-up perspective to their clients. Think of reputation as a long-term game. Don’t just say the key message, but do the right thing. The emergence of social media ushered a welcome premium on authenticity, transparency and respect for consumers. It’s my sincere hope that the PR industry can help reinforce this spirit and ensure facts remain an integral part of our public discourse. The Internal Communication function is changing dramatically, largely by necessity. And that’s a good thing. Much like peers in other communication disciplines (as well as more distant professional cousins in marketing and advertising) IC pros are reinventing themselves in the face of tectonic shifts in technology, communications and consumer behavior. Integrator – By virtue of their unique position at the nexus of internal and external communications, leadership outreach and internal support functions (e.g. IT and HR), IC pros are in the best position to facilitate coordination across teams and regions to ensure goals, activities and messages are aligned and coordinated. This is particularly true with major cross-company programs like internal branding or M&A outreach that lack an obvious leader. This critical integration role is more than being an enabler – which is more passive – and assumes the IC pro will stretch beyond his/her functional mandate to fill a role that often isn’t well defined or staffed. Without this integration, however, most company programs will probably fail. Data Analyst – It’s become a truism we are drowning in a sea of data. Big data. Small data. Consumer data. Even employee data. All communicators need to become educated, if not resident experts, in the gathering, analysis and communication of this information. This area is particularly ripe for leadership inside organizations, where many HR teams (traditionally the keepers of workforce data) lack the expertise of marketing/PR teams and are struggling just to update their surveying models. And relegating this role to IT teams, who often manage intranet and platform statistics, isn’t good enough, since those teams usually lack the skills the review the raw numbers for analysis and insights. IC pros should lead the process of collecting, aggregating, assessing and responding to the rich data available on their employees. Content Curator – IC professionals use to be the primary authors of content in their companies. That role is still important, but it’s become even more important to act as curators of content, helping to blend and share news and information from leaders, external sources and the employees themselves. Some of the best stories and ideas come from employees, so IC pros must ensure there are channels to collect and post this content. There is still an important role to provide editorial guardrails to ensure all shared content is ‘brand safe’, but that’s where communicators need to be more curators than gatekeepers. There is also an important role to play in acting as interpreter for leaders, who are sometimes well intentioned but ineffective and reluctant communicators. Whatever the source of content, the emphasis on authentic, compelling and timely information has made the traditional one-way communication model irrelevant and ineffective. Listener – One of the most valuable roles IC pros can play is simply to listen to their internal stakeholders; to uncover, understand and respond to the concerns and preferences of employees. Though many inside the typical organization are responsible in some way for listening and responding to employees – notably front-line managers – most usually focus on sporadic, face-to-face interactions and don’t strive to pull the input together into a coherent, actionable narrative. Internal Communication pros can and should play this role, and also steer the company’s response to the input (perhaps through new policies or programs.) This listening role can be formal (gathering data through internal surveys and audits), part of the daily role (community manager for internal social platforms) or mostly informal (lunch meetings with staff or local in-house reporters.) Whatever the approach the IC professional becomes the most accurate and current advocate for the employee community. Innovator – In many companies no department has the formal responsibility to foster innovation inside the organization, save perhaps a small strategic planning function. Often, the marketing or PR function take on the mantle, but their efforts are usually narrow and may not consider issues like workplace technology and business or entertainment trends. Conversely, most HR and IT teams lack the desire and/or bandwidth to drive innovation inside their organizations. This innovation gap is an opportunity for IC professionals, who have visibility and impact across the organization. Even small innovations like new social platforms or communication content (interactive infographic) can send a strong message and spark more ambitious planning across departments. Two examples of how IC teams can drive innovation across the enterprise is through employee advocacy programs and virtual employee ‘jams’, which often spur the adoption of social technology across the company. Expert Counselor – Many IC pros have garnered reputations inside their organizations as ‘go to’ experts on not just communication, but a range of related issues like employee engagement, corporate reputation and emerging technology. Given that IC staff frequently brief, interview and/or counsel leaders as part of their work, they are perfectly positioned to share their insights and counsel. The role of wise counselor is not easy to gain or keep, but it’s well worth the effort. Leaders today are looking for smart analysis and cogent guidance, particularly on emerging business trends, and those who provide that will gain in profile and credibility. A caveat: this counsel should be strategic, not just focused on tactical execution – a shortcoming which has eroded the credibility and standing of the IC function in the past. Multi-Media Storyteller – It’s well documented that often the best way to share information is through a compelling, episodic narrative shared across media formats. Internal Communication teams are ideally positioned to drive this process internally, pulling together capabilities like writing, design, promotion, video, social technology and executive outreach. As noted previously, communication staff should be the ones who uncover, shape and help share the internal stories. 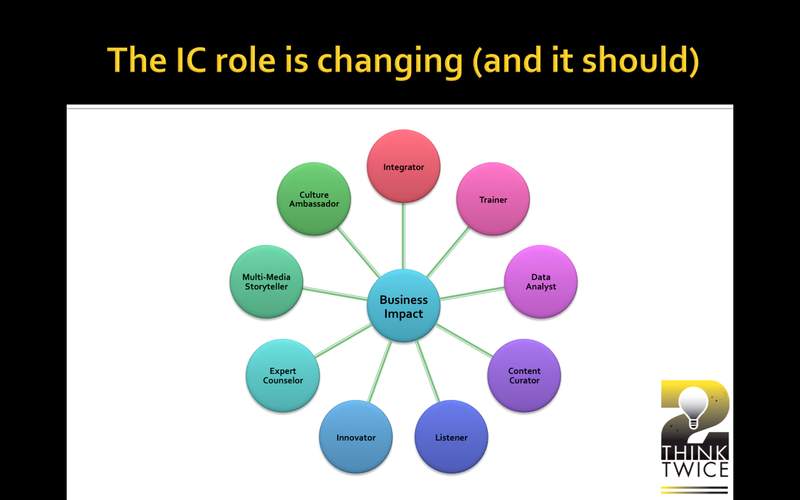 IC teams also usually manage their company’s intranet, which can be a powerful multi-media delivery channel if used effectively – the Swiss Army knife of internal tools. Conversely, teams that stick to outdated communication channels (email) and styles (formal text) are missing an opportunity to break through the clutter and truly engage their audience. Culture Ambassador – Though HR has historically taken the reins to promote culture inside organizations, IC pros are probably better positioned to help define, celebrate and promote a company’s distinctive culture. IC teams often have strong capabilities in marketing, messaging, social dialogue, digital content and even collateral – which together can pack a powerful, convincing punch. Furthermore, IC pros often take on the role of employee advocate inside their organizations, ensuring that the needs and aspirations of employees are heard and considered in decision-making. The purpose is not just altruistic, but an effort to ensure communication is relevant and credible. The emergence of employee advocacy, virtual meetings and crowd-sourcing programs only reinforces the role of internal communicators as keepers of the culture. It’s true that taking on these new roles likely entails more work – or at minimum very different work – and certainly more risk and responsibility. And it assumes a great deal of research, networking, learning and adapting – and that never stops. But inertia is not really an option. Failure to proactively take on these critical roles – which too often go unfilled – will limit the function’s value inside an organization, and probably erode the team’s reputation and credibility. It’s taken years of effort for IC pros to get a place at the proverbial leadership table and gain the reputation of strategists, not just order-takers or tacticians. Now IC pros have the opportunity to not only secure their place at the decision-making table, but to expand their traditional role and enhance their reputation. It won’t be easy, but the effort is well worth it. This recent post in Huffington Post on Hillary Clinton’s authenticity (or lack thereof) got me thinking about the evolution of authenticity as a paragon of communication. In recent years, the immediacy and transparency of social media has increased the premium on authenticity – being true to your identity or person and avoiding artifice, hype or self-serving promotion. Over the years I have worked with numerous leaders and politicians striving to identify and promote their identity and genuine brand attributes – to be authentic. The premise is that an informed and empowered consumer (or voter) will not accept a disingenuous or fabricated persona, or marketing message. I still believe that striving for an honest, credible portrayal of oneself (or a company or culture) is critical, but is it enough? I’ve concluded that being authentic, in of itself, is not enough to foster lasting relationships with your audience(s). Let’s take Donald Trump as a prominent example. Trump is unapologetic about being himself – for better or for worse, whether he contravenes political correctness or not. He ignores political conventions and etiquette, he blusters (apparently without script) about any topic, and he liberally throws around vitriolic insults at anyone who dares criticize him or his persona. Throughout this process, Trump seems to relish in being Donald Trump – or the persona he has crafted and become in the public consciousness. While Trump has garnered the headlines and the support, the cautious, reactive campaigns of other GOP candidates have generated more credibility problems than excitement with the public. Politicians like Scott Walker and Jeb Bush, along with Hillary, are the anti-thesis of Trump. In fact, all three of these candidates have suffered due to their lack of candor, sincerity and accessibility on contentious issues. Based on polls I’ve seen, most Americans seem to question the authenticity – or trustworthiness – of these candidates. Their outreach seems designed not to share candid personal views or insights, but to sell a proactive electoral platform and carefully crafted persona. These candidates may at their core have real beliefs and policy ideas, but we’d be hard pressed to judge which ones are entrenched and which are promoted for political expediency or to avoid controversy. In other words, they are having difficulty making the case they are authentic. But there is another side to Trump’s transparent “deal with it” persona. Yes, he certainly appears to be a distinctive personality and has carved out his own unique style. He is, in short, authentic and entirely original. But what of the view that he is also a bigot and misogynist? Or woefully ignorant of political minutiae and world affairs? Or laughably egotistical, thin-skinned and petty? All of the those criticisms have some strong proof-points and cogent advocates. In other words, he may be real, but is he a positive, effective candidate to be president of the country or is he a self-promoting clown? I would posit that by itself authenticity isn’t enough if the person or brand being featured doesn’t align with the values, beliefs and aspirations of his/her supporters (or consumers.) In other words, you also have to be relevant, credible and yes, even likeable. What is the true value in an authentic narcissist or bully? I would also argue that beyond an authentic personality, there needs to be authenticity for the actual ideas being promoted by candidates like Trump. Indeed, there is likely value in having passionate, consistent and convincing ideas (and content) rather than chasing polls or simply tossing out bumper-sticker slogans with little intellectual or empirical heft. The focus on authenticity has also obscured the reality that politicians (and companies) need to do more than talk about themselves – they have to listen. And respond. And presumably also accept the ideas and criticisms of their followers or consumers. One could argue the implicit contract with fans or consumers – on social platforms but also through traditional media channels and political settings – is that the discussion should be civilized, with a measure of decorum, fairness and balance – like any reasonable conversation. That’s the basis of code of conduct for public communication in many organizations, and what keeps discourse on the web from becoming a troll free-for-all. I’m not certain Trump is willing or able to show this level of civility, humility and empathy. Being elected, or selling a product, is not a one-way conversation or license to be obnoxious under the guise of being honest and unfiltered. Even if you are an authentic original. For these reasons I think Trump’s wave of popularity is not sustainable. Will he actually be the GOP presidential candidate? The jury is out, but my guess would be no. For the past few months there seems to be growing buzz in social media (and communication) circles about employee advocacy. Companies like IBM, Target, Dell and Starbucks are sharing positive updates about their programs. Employee advocacy is clearly being pitched as the next big thing, and with good reason – as you can see later in this post. But despite the huge potential benefits to companies (and employees), staff advocacy programs are not a magic bullet, and not for every company. Like any other social media program, you need to be smart, realistic and deliberate about your approach. So I’ve developed a checklist of issues communication pros should carefully consider before they embark on an advocacy program. Before I get to the checklist, let’s review a quick definition and look at the rationale for employee advocacy. Employee advocacy is mobilizing trained employees to share company-approved content through employee-owned social channels to engage consumers, peers and family. (Italics are intentional, underlining critical elements of an advocacy program.) Advocates typically do not have social outreach as a formal part of their jobs (like subject matter experts who blog on the company’s behalf.) In essence, advocacy programs allow your employees to tell your company story. As for the potential benefits of employee advocacy, they have been well documented and are backed by robust research and results. At its core employee advocacy helps amplify your marketing efforts, increasing the credibility, reach, audience and engagement well beyond levels for typical corporate outreach. This can translate into a boost in a company’s online profile, reputation and fan base. But the bigger payoff is through the potential for an increase in sales leads, revenue and profits. Enlisting your employees in an advocacy program can also help drive staff engagement, and given the stubbornly low engagement levels, that’s a very good thing. Beyond the profile boost for your branded content – the explicit messages you are sharing – advocacy programs send powerful symbolic messages to both consumers and employees. For employees it says: your ideas matter, we trust you, we believe in our company and we support your personal brand. For customers it says: we’re part of the conversation, we live our values, we’re proud to tell our story, we trust and value our employees and we’re a leader. So with all this promise, why shouldn’t companies start an employee advocacy right now…if they haven’t already? The short answer is they may not be ready. The list below provides a good template for readiness for an advocacy program. Can you be authentic? – To be effective long-term, employee advocacy programs must authentically align with their culture, brand and employee interests. Authenticity is a central ethos of social media, with a premium on transparency and responsiveness. That means no hype, no fluff, no dishonesty and no hiding. Does your company’s marketing and PR content truly align with these values? Do you have social infrastructure? – Although there are good technology platforms that companies can easily adopt to manage their advocacy programs, companies with limited or no social capability and/or cultural acceptance will have a much steeper learning curve and a tougher time driving adoption. It’s also important to have internal systems that allow (even foster) multi-directional dialogue and content sharing. Is your social media policy overly complex or restrictive? – No matter how well you design and execute your advocacy program, it will lag if your social media policies confuse or inhibit your employees. Is your content compelling? – Perhaps the biggest barrier to a successful advocacy program is stale, self-serving content. Boring is bad. Leading companies use a formula that emphasizes industry and employee-generated content (multi-media of course) over typical marketing content. In other words, treat this as a conversation and not a pushy hard sell – which is anathema in social media. Do you recognize and value your employees? – Good advocacy programs do a great job of recognizing and rewarding participants. (IBM even ranks the most prolific and popular advocates.) Do you already have credible programs in place to recognize your staff? Are you willing to make your employees the stars of the program? Will you be social in good times and bad? – Any social media program requires sustained commitment to be credible and relevant, and advocacy programs are no exception. Shutting down during a crisis will create a backlash and erode your credibility. Furthermore, your staff will likely want to have their voice heard in tough times. Are you good at listening? – Beyond the marketing boost, a big advantage of employee advocacy programs is the acquisition of content-related data and insights on your customers and employees. If you are not already in the mode of listen-learn-adapt, however, these benefits will be lost on you. Do you trust your employees? – The most important litmus test of any advocacy program is whether you trust your employees. The best programs assume their employees have good intentions, and give their staff plenty of leeway – including choosing the role and content that fits their skills and interest. Programs that are dictatorial or stifle creativity will not be successful. Monitoring and discipline should be a last resort, not a default out of the gate. It’s likely true that a good advocacy program can actually help fix many of the issues listed above. But I would suggest you start with a strong foundation. Walk before you go social, as it were. In recent weeks I’ve witnessed several instances of public figures using talking points, or planned messages, in ways that should make every PR professional cringe. Perhaps the most visible example was the brouhaha surrounding Indiana’s Religious Freedom Restoration Act, when Governor Pence appeared on talk shows to defend the proposed legislation – which was widely criticized for allowing, perhaps even encouraging, discrimination against the LGBT community. In one widely publicized interview, Pence methodically repeated his key talking points – including the widely debunked argument the Indiana RFRA was identical to a law passed by other states – even as the host provided detailed evidence to the contrary. To make matters worse, Pence repeatedly avoided answering a direct question about whether the law allowed discrimination against LGBT consumers, reverting back to stock messages that were not relevant. By most assessments, Pence did not fare well in the interview, yet his discredited talking points lived on even as the legislation was amended (despite Pence’s earlier claims to the contrary) to reflect the widespread criticism. In fairness, this stubborn adherence to irrelevant or misleading talking points isn’t limited to one side of the political spectrum. Last week US Senator Bob Menendez was indicted on criminal charges of bribery and corruption. The surprise wasn’t that Menendez pleaded not guilty, but that in his remarks he defiantly pronounced his innocence and defended his actions with arguments (and messages) that strained credulity given the scope and detail of the accusations. Undoubtedly, we will hear his script repeatedly as we wait for the legal process to unfold. Like many communication professionals, I believe there is great value in proactively planning speaking points to position your argument (or product or policy) in the best possible light. I’ve trained my share of leaders on this practice. But there are several critical requirements to ensure this is done effectively, meaning the messages are relevant (in some way relate to the question and circumstance), supported by proof points and perceived as credible, or at least plausible and appropriate. It’s also important the messages be adaptable and evolve to reflect their resonance, or lack thereof, with observers. Worse case scenario, the audience or interviewer could disagree with your position, but not call into question your bona fides or integrity. Unfortunately, the practice of talking points has become pervasive and perverted in recent years. Now it’s common practice for politicians, for example, to align on a set of partisan messages and repeat them with numbing frequency, notwithstanding the occasion or even the question. In the worse cases, these talking points are often misleading, if not outright fabrications; more slogans or aspirational headlines than information. What used to be shared as opinion or suggestion is now peddled as fact. The thinking appears to be that if you repeat something often enough – even if it’s not accurate or relevant – people will start to believe it. Maybe the most surprising aspect of this is that the speakers appear oblivious to the fact their statements do not pass the sniff test. Witness the recent announcement by Senator Ted Cruz he was running for President. Cruz’ stump speech (ironically headlined with the theme of truth) is littered with sweeping, provocative claims that have been widely debunked, and not just by the obvious suspects on the other side of the partisan divide. Yet, Cruz appears happy to continue repeating his punch lines, presumably content that his target audience (conservative Republicans) is quite happy to believe in his worldview. My issue here isn’t with Cruz’s arguments or politics, but that he appears totally unconcerned about the widespread, repeated questions about the veracity of his statements. What me worry? Like other industry observers, I suspect this neo-propaganda model of talking points owes something to the most infamous examples of intentional misinformation: the tobacco industry’s decades-long denial of health hazards from smoking. Other industries – notably the oil and gas sector – have followed a similar model of incessant lobbying fueled by massive advertising and marketing, all scripted by carefully written narratives and slogans with a tenuous relationship to truth or public interest. Now politics seems to have fully embraced this campaign model, designed more to shape public policy and sway voters than to educate or foster dialogue. The problem with this paradigm, I would argue, is that the cumulative impact of this disputed, polarized messaging is the eroding credibility and relevance of the process and the messages themselves. Does anybody really believe what the politicians are saying? Or does having evidence to back your messages even matter anymore? A number of recent surveys on low levels of trust for a wide range of sources – notably politicians, journalists and corporate leaders – suggests there is a serious credibility gap in public discourse. The result of all this, I fear, is collateral damage for the reputation of the PR profession, already struggling with accusations of spin and ethical lapses. All communication pros should carefully consider their own actions in these situations. What are the values and principles that guide our counsel and behavior? I believe our profession needs to take a stronger stand with our clients or company leaders, and promote a more authentic, relevant and cogent messaging strategy that can stand up to objective scrutiny. In short, stand up for the truth. Over the past few years, I’ve often questioned why so many communication professionals – both in-house and in PR agencies – were slow and hesitant to adapt to the dramatic industry changes sparked by social technology. There are many logical explanations for this lag: caution about legal issues, concern about a public misstep, fears about rogue employees, a distaste for real (and potentially negative) interaction with consumers…the list goes on. But based on recent research I’ve seen the explanation may be more basic: most PR professionals simply don’t have the social media skills and expertise to be effective (or confident) advocates for change. This excellent post by friend and former colleague Richard Binhammer provides a good summary of the skills gap in marketing and across the general US employee population. Indeed, the problem is not limited to communication professionals. However, this is where the problem is most acute and noteworthy, since our jobs dictate that we provide cogent, informed counsel and support on digital engagement with both external and internal audiences. By some estimates in these studies, only about 10 percent of workers truly understand digital technology well enough to incorporate that knowledge into their work and planning. For more background on the PR skill gap see this article and this study. Even millennials, who tend to be much more tech-savvy than older workers and use most major social platforms every day, have their blind spots. Though younger workers have grown up with the mobile Internet and have likely posted most of their lives online, they lack the strategic savvy and broader perspective required to use their knowledge in a business context. Put another way, they understand the technology, but not the PR business. This article in Fortune provides a good snapshot of the millennial strengths and weaknesses. All of this evidence reflects what I’ve seen over the past 10 or so years as both a communication executive and consultant. We are falling behind in a digital world. Badly. Events like SXSW, the tip of the spear in digital innovation, suggest that everybody is fully immersed in digital media and driving cutting-edge social media strategies in marketing, advertising and communications. But I don’t think the folks at SXSW reflect the average PR professional, or company – particularly outside the tech havens of Silicon Valley, Portland and similar global outposts. Leaders who are socially savvy and proactive are extremely rare, the proverbial unicorn. A surprising number of communication teams seem to rely on one or two in-house digital gurus – typically social media managers, digital designers or marketing experts – who are often over-taxed and overwhelmed. Lacking adequate depth and breadth of critical social skills, many communication teams rely on a range of outside experts ranging across digital disciplines to cobble together programs: web design, platform vendor/technology, visual/video content, editorial content, social community management, research and analytics, and so forth. I’ve rarely seen all this requisite expertise housed within a PR agency or team, much less inside the same organization. Though the outsourced virtual “best team” approach may be effective in the short-term, it doesn’t support the efficient, dedicated work required to plan and execute a robust digital strategy. There is urgent need to address this social skill gap; the credibility, relevance and effectiveness of the communication/PR business are at stake. The solutions are obvious, if not easy or inexpensive: training in social media history and skills; built-in time to participate in relevant seminars and meetings; progressive BYOD and social media policies; reverse mentorship programs; recruitment of tech-savvy professionals; mandatory boot-camps on digital metrics; and, alignment with related disciplines (i.e. digital design, intranet technology, social analytics, CRM.) Smart communication leaders will take steps to ensure they – and their teams – become the social media experts their clients expect and need to be successful in the digital age. Without making progress in the social skill gap, I fear PR may simply be pushed out by smart marketing or technology firms (and teams) who pull together the requisite social capabilities. During SXSW a few weeks ago I had the good fortune of meeting a number of my former colleagues from Dell, where I worked from 2002 to 2006. During my stint there I had the incredible good fortune of working on the team that would design, develop and manage Dell’s then new – and since much lauded – social media program. But our conversation didn’t dwell so much on the good old days as the realization that years later many companies are still hesitant to embrace, or even explore, the full potential of social media technology. This despite the dramatic increase in cheap, user-friendly technology to support everything from targeting to analytics to collaboration. In fact, outside of some perennial leaders – many of them in the technology industry – many organizations are still grappling with the same questions and fears we saw almost ten years ago. And this is particularly true of companies exploring a social strategy inside the enterprise. (As just one example of this slow going, the folks at Prescient Digital estimate that only 4% of companies have a truly social intranet system.) After comparing notes about our respective clients and consulting gigs, we concluded many of the original arguments, tools and basic social media models we developed in those early days were still relevant, and very much in demand. Bunker Mentality – There’s no way to escape the dramatic tectonic shifts in new technology and the related impact on entire industries, including news media, advertising, retail, music, and not least communications and PR. The dizzying pace of new products and functionality makes it even harder to keep up with change. While some organizations seem invigorated by these shifts and flood of new opportunities, many have reacted with grudging, superficial tactics without changing their strategy or business model. In many ways, they are still in denial. Inertia – The sad reality in any corporate setting (indeed, perhaps even in human nature itself) is that there is very strong momentum for doing things the way they’ve always been done, particularly in times where staffs are lean and driven by short-term objectives. And despite all the hype around innovation and risk, very few organizations have cultures that encourage, or even allow activity outside the norm. Often, companies need a major event like a new strategy or leader to encourage a shift in direction. Without that, it’s difficult to change old habits. Functional Insularity – Functional departments that would typically help spark and support innovation and change – or at least be the sources of new ideas and information – are often the most insular, reactive ones of the bunch. HR and IT, for example, are in many cases reluctant bystanders to progress and sometimes surprisingly uninformed about new technology or trends. (In some of my social media projects, in-house IT departments are either reluctant partners or standing on the sideline.) The one department that seems to have embraced change, albeit sometimes reluctantly, is marketing. PR is often caught in the middle of this dynamic and too often unwilling or unable to drive its own momentum. Boomers Dominate Leadership – Though statistics suggest boomers are among the fastest growing users of social media platforms like Twitter and Facebook, many older workers are less familiar and comfortable with new technology, social or otherwise. This helps explain anachronisms like the CEO who refuses to use email or others who shun any type of digital discourse. The grizzled leadership in many PR companies has the same generational anxiety about trying new tools and approaches. This trend should change as younger, much more tech-savvy workers gain leadership roles. Knowledge Gap – Save perhaps for a few precocious millenials, very few of us in the PR industry start with a deep base of knowledge in social media or related technology. What we know is what we’ve learned in the past decade or so as social media has become more prevalent in our lives. So it takes effort and commitment to remain in learning mode and stay current on major trends and new platforms. Unfortunately, it seems too many PR pros are counting on a few resident tech nerds or outside experts rather than upgrading their own knowledge base. Taken together, these factors help explain the myopic outlook and slow adoption of social media in PR. And I’ve experienced every one of these barriers, so I have some understanding for the challenges in our business. But they shouldn’t be an excuse for inaction. I don’t want to be having this same discussion in 5 years.